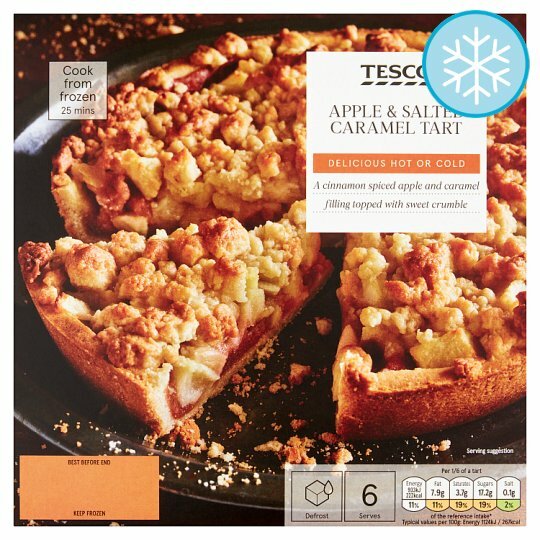 Apple and salted caramel flavour filling with cinnamon, topped with diced apple and crumble in a shortcrust pastry case. Apple (36%), Wheat Flour, Apple Pulp (17%), Sugar, Vegetable Margarine, Pasteurised Egg, Maize Starch, Wheat Starch, Whey Powder (Milk), Salted Caramel Sauce, Fructose, Apricot Kernels, Acidity Regulators (Citric Acid, Sodium Citrate), Flavouring, Cinnamon Powder, Salt, Dextrose, Raising Agent (Sodium Carbonate), Invert Sugar, Potato Starch. Vegetable Margarine contains: Rapeseed Oil, Palm Oil, Water, Emulsifier (Mono- and Di-Glycerides of Fatty Acids), Acidity Regulators (Citric Acid). For allergens, including cereals containing gluten, see ingredients in bold Also, may contain peanuts and nuts. Instructions: 200°C/Fan 180°C/Gas 6 20-25 mins Place on a baking tray in the centre of a pre-heated oven for 20-25 minutes. Leave to stand for 1 minute after heating. Remove all packaging, including card from base. Follow the preparation guidelines below to serve hot.